The decision by the Asean Defence Ministers Meeting-Plus (ADMM-Plus) gathering in Malaysia last November to scrap a planned joint statement was a stark reminder of persistent differences among some of its member states over the South China Sea issue. The ADMM-Plus is made up of 18 countries: the Asean 10 and Australia, China, India, Japan, New Zealand, Russia, South Korea and the United States. That decision late last year fostered the impression that the ADMM-Plus could go the way of the Asean Regional Forum, an older and more established regional experiment in security cooperation, which many today feel has grown moribund. Moreover, despite the decision by the ADMM-Plus to conduct its ministerial gatherings on a biennial rather than triennial basis, some pundits warn of the risk of the ADMM-Plus ending up as a "talk shop" that achieves little by way of real progress. But for the defence officials and military practitioners who make the ADMM-Plus tick, nothing could be further from the truth. Since the inaugural ADMM-Plus in Vietnam in 2010, joint military exercises involving the 18 member countries have grown in frequency and complexity. Working groups set up in areas such as counter-terrorism, humanitarian assistance and disaster relief (HADR), maritime security, military medicine and peacekeeping have started to bear fruit, albeit more in certain areas than in others. 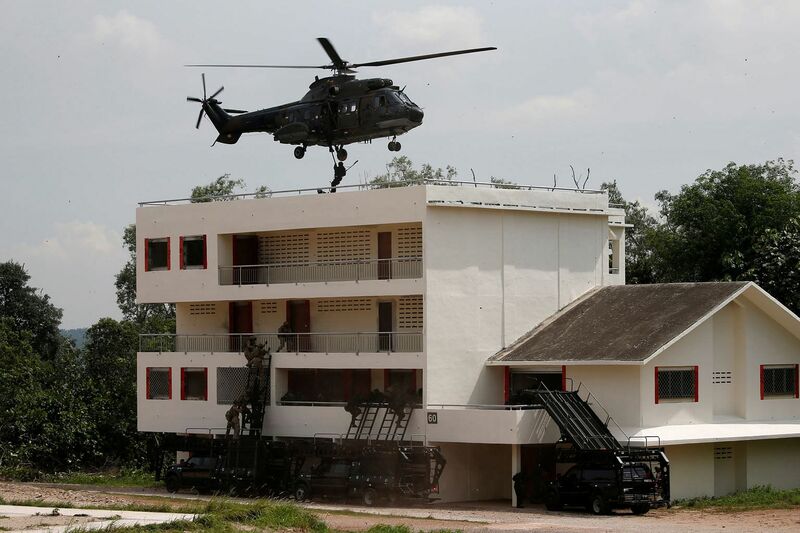 A joint exercise on HADR and military medicine held in Brunei in 2013 brought all 18 countries and their respective armed forces together for the first time and involved 3,200 personnel, seven ships, 15 helicopters, as well as military medical, engineering and search-and-rescue teams. Notably, China dispatched the People's Liberation Army (PLA) Navy hospital ship Peace Ark to the exercise, and the US Marines and Seabees worked side by side with their counterparts from China and other participating countries. That same year, the ADMM-Plus conducted a counter-terrorism exercise in Indonesia and a maritime security exercise in Australia. Other smaller-scale exercises followed suit, such as a "table-top" peacekeeping exercise held in the Philippines in 2014. All of this has been topped by the most recent ADMM-Plus exercise in maritime security and counter-terrorism held in Brunei and Singapore earlier this month. A total of 3,500 personnel, 18 naval vessels, 25 aircraft and 40 special forces teams from all 18 countries participated in shore-based activities in Brunei and in exercises that simulated terrorist attacks at sea en route to Singapore from Brunei, and on land in north-western Singapore. According to Singapore's Defence Minister Ng Eng Hen, the scale of the exercise itself and the keen political investments of all stakeholders in the ADMM-Plus constitute "a very strong signal" that the ADMM-Plus countries take maritime security and the threat of terrorism seriously and are prepared to mount multinational efforts to maintain peace and stability in the region. Worries that the ADMM-Plus is just a talk shop are, therefore, unfounded. Still, whether member countries can sustain their present level of commitment in the long run is questionable. Moreover, how they actually benefit from ADMM-Plus activities is equally unclear. Some gains are obvious enough, such as strengthening the capacities of countries to respond swiftly and decisively to humanitarian crises or to terrorist attacks, and to do so collectively. Their militaries can also develop habits of cooperation, a level of interoperability and mutual confidence necessary to ensure the success of their missions. On the other hand, the demonstration of commitment, goodwill and resolve in the ADMM-Plus has not been as effective in reducing tensions in the South China Sea or deepening strategic trust and confidence among member countries as one might have wished. Whether the good collaboration between China's PLA troops and their Japanese and Philippine counterparts within the ADMM-Plus has had any positive bearing on their respective disputes in the East and South China Seas is uncertain, perhaps, even unlikely. According to a 2016 study in the Australian Journal Of International Affairs by analysts Daniel Baldino and Andrew Carr, the utility of defence diplomacy - as ADMM-Plus activities have been labelled - as an instrument of statecraft to defuse tensions, reduce hostility and shape the behaviour of states towards one another has been overstated. Instead, their research shows that defence diplomacy is considerably more useful as an approach for dealing with precise and immediate security issues rather than in shaping major strategic outcomes. For the foreseeable future, it is unlikely the ADMM-Plus will be able to transform the increasingly toxic state of the security environment of the region and overturn its massive trust deficit. But that should not preclude the ADMM-Plus from being the place where defence ministers can engage openly in frank and constructive discussions over the region's most urgent security matters. It could also be the platform through which defence officials can extend the Code for Unplanned Encounters at Sea (Cues) - a non-binding pact, signed by 21 countries at a naval conference in China in 2014, to avoid incidents at sea between countries from occurring and to prevent those that have occurred from escalating - to cover the South China Sea. For example, ADMM-Plus countries could consider implementing a Cues arrangement for the South China Sea through twinning it with the conduct of joint maritime security or HADR exercises in the South China Sea. Small, but no less significant, steps like this are attainable so long as member countries are prepared to work together pragmatically as they have hitherto done in the ADMM-Plus. The writer is Professor of International Relations at the S. Rajaratnam School of International Studies (RSIS), Nanyang Technological University, and Deputy Director of the Institute of Defence and Strategic Studies at RSIS.